Really! The leaves may come and go, but it is beautiful out here in the country during winter, spring, summer, and fall! Plus, the scenery is constantly changing – thanks to a husband who loves to plant and move things around the yard. A lot of my clients come from the city of Atlanta, so being in the country is a nice change for them – and most kids don’t want to leave! The property is rather large and has quite a few different spots to take photos in. This ensures that no two sessions will be exactly the same – especially when it’s a different season or time of day! I have included several examples of families, high school seniors, and couples below so you can get an idea of the many different looks available here. I have done a lot of on-location photo sessions the past 12 years (that’s for another blog post!) and I honestly feel like there are more options for my clients here than at a local park, if that is the look you’re looking for. This is my absolute favorite perk of having sessions at my location. Whenever I have a photo session at a public park or other location, we have to wait for other people to leave the spot we’re wanting to take photos in, dodge them in the background, wait for them to pass, and so on. When you come to my location for your portrait session, it is all about you! There are no crowds of people to compete with and you’ll have privacy during your session. 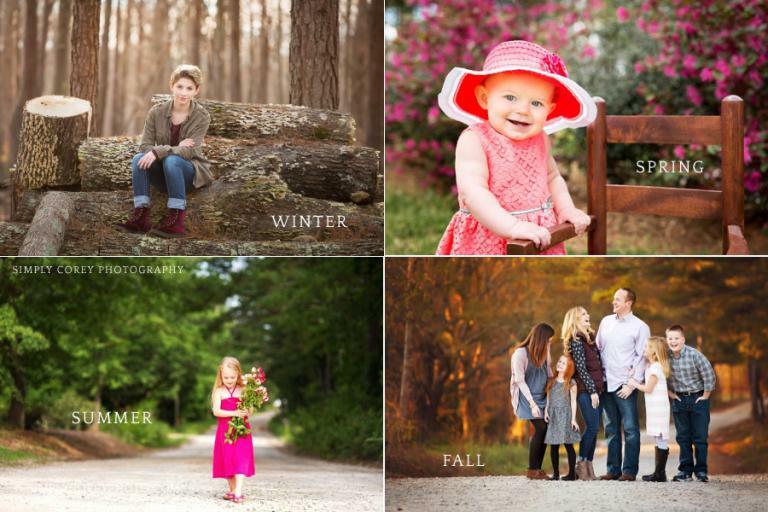 My location is ideal for family portrait sessions! As I mentioned before, it is private and quite spacious. This is especially perfect for families with younger children who may get distracted by other people or dogs if we were somewhere else. It also provides a laid back environment so everyone can relax more. We can get creative and your little ones can wander and explore while I photograph them. All without the worries of a busy public location! Is your high school senior outdoorsy? This is the perfect place for them to show off their outdoor extra-curricular activities or just the love of the outdoors. Your senior is welcome to bring their vehicle, their pet, sports gear, and more to their portrait session. The property has many photographic spots, so their final gallery will have plenty of different looks. We also have a vintage dump truck on the property that teens love to be photographed with! I often get asked if I have a studio space. The answer is yes! My home studio has been a work in progress and I will be announcing more on the blog soon! Studio portraits are great for maternity, newborns, baby milestone sessions, children, and headshots!